Taking risks within SEO is nerve-racking. What if you try something new in SEO and it tanks your performance? What if you make a code change that causes a server error and your site is down for hours? Sometimes it pays off to play it safe and not do anything, but other times it’s worth taking a safe risk to drive more traffic. One safe risk I take involves optimizing keywords that are on page two or further in Google. The goal within SEO is to get your target terms on page one, so anything past that feels like no man’s land. In fact, there have been studies that showcase the majority of searchers don’t go past page one in Google. Even if a keyword on page three drops off to page ten, you are not losing anything. Instead, you will receive traffic if you can move the term to page one. My favorite SEO tools include Moz, SEMrush, and Ahrefs to discover keywords past page one of Google for a website. All three tools are relatively the same, so I will go back and forth withing Ahrefs and SEMRush in this blog post. In this example below, I’m going to use Ahrefs since they have the most apparent case out of the three for keyword conflict opportunities for my website. By using the organic keywords section within Ahrefs, I saw two different pages rank on page five for the same term. A term ranking on page five for two different pages is known as keyword cannibalization. You’ll see below that I was able to remove the keyword conflict and get one page to rank on page one within Google with the steps I’ll outline below. As a note, I receive traffic to my website each month due to this term being on page one within Google. Theorizing why Google ranks specefic pages for specific terms is fun. I’ve been in the SEO field for years now, so I’m pretty good at coming up with educated guesses. By diagnosing both pages, I saw the following similarities that would confuse Google into knowing which should rank. As you can see above, I made both pages on my site too similar for search engines to know which was more important. Google and Bing would look at these two pages and struggle with why one should outrank the other. Number five in the list above was my clue that the homepage should be my target because Google was crawling it more often. If I want to rank in Google fast, I should take what Google wants to crawl on a daily basis because that will get rankings quicker. By having both pages target the same term in the title tag, I knew I had to take a two-step approach. I kept the target term for my homepage, but I gave a semantic phrase to the competing page’s title. I knew that the semantic phrase has less search volume, but it’s a clear way for me to go after two terms without conflict on my site. Second, I rewrote the body content on the homepage to reflect more keywords. You can have hundreds of keyword variations stem off an initial word, so you want to add semantic language to your page. For example, I might have a page about how to bake cookies. To add semantic terms to the page, you can use words like deserts, baked goods, and sweets since they are similar to cookies. If you are looking for more information on what I’m referring to, you should check out what Google Hummingbird is all about. Video optimization is a fantastic way to optimize your content even further. My video hosting provider of choice is Wistia because their code is readable for search engines. 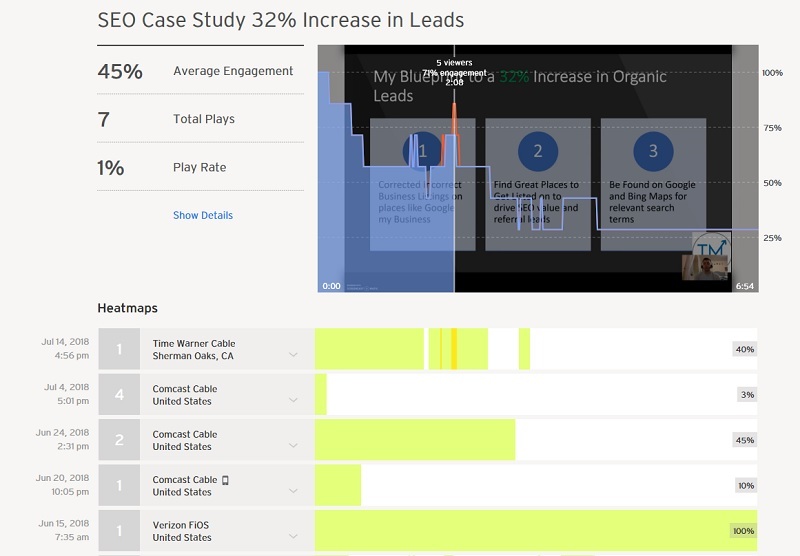 Video engagement helps with my site regarding lead generation. People who watch videos on my site more often than not contact me for work. I record the videos because I’m a visual learner, so some members of my audience might be as well. Having the videos read by Google and Bing is a bonus too. Finally, you want Google and Bing to crawl your changes as soon as possible. Both Google Search Console and Bing Webmaster Tools have features where you can crawl your pages as their bots. 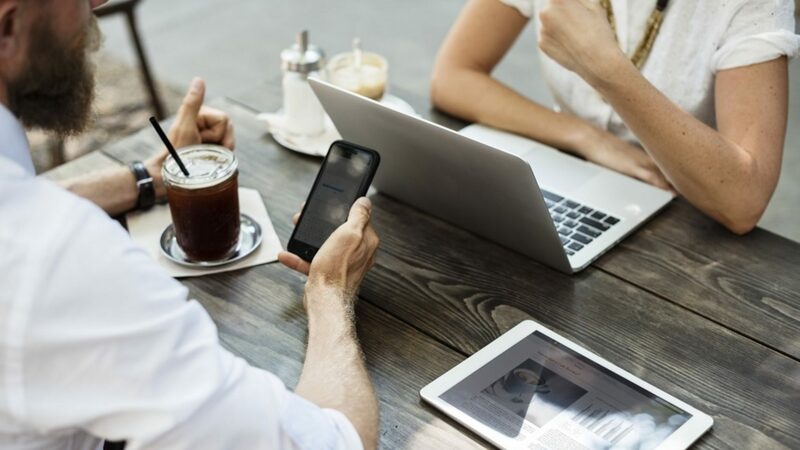 A fresh crawl means a chance at rankings to improve at a fast rate, so you should get in the habit of doing this when you make changes on your site. There are many ways to track SEO performance. Daily keyword tracking is one of my favorite choices for measuring SEO strategies. Spotting growth patterns can give you the confidence that your approach is starting to work for your website. Peaks and valleys can be expected when you have daily tracking, so don’t freak out if there is a drop for a few days. You want to look for linear growth patterns, so that should be the ultimate goal. For my keyword tracking, I use SEMRush for daily keyword rankings. If you are interested in tracking your terms too, you can use my 14-day affiliate free trial to SEMRush. If paid SEO tools are out of your budget, you can still gather SEO insight via the free tools from Google and Bing. In Google Search Console, you will need to look at is the search analytics report section to spot the trend. If you notice impressions growing for your target page, you can theorize that you are moving up higher within Google’s results. An impression is counted when your result loads within the search results. So if you are position ten on page one, you will receive an impression because the page loads regardless if you get a click. Bing Webmaster Tools is equivalent to Google Search Console, but the data is for Bing and Yahoo. Same as before, you use the appeared in search section to see if you’re growing in impressions. 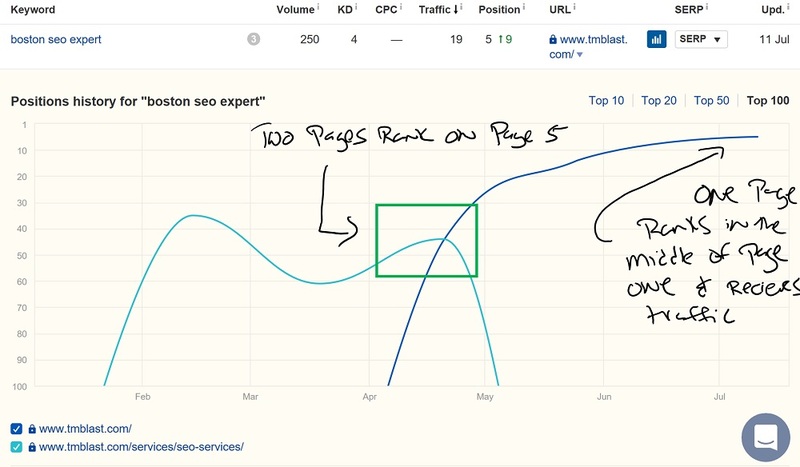 Before you dismiss this search engine, TM Blast receives 30% of its traffic from Bing. According to GS Stat Counter, Bing makes up about 20% of the U.S desktop market share. Wouldn’t you like to get more than 20% additional traffic to your website? Log file analysis can uncover deep technical issues that search engines experience when they visit your site. For example, Google encountered 23% errors when visiting my website for months. That meant that Google did not see my homepage and other critical pages often. Pages not frequently crawled can cause a few issues. First, Google and Bing do not see your latest edits if there is a gap between a publish post and a crawled post. That means that Google won’t see the new content or video you added to your page for days or weeks. Second, Google may crawl your site less often due to the headache it deals with due to the errors. That means that your entire domain suffers for the future because Google remembers that the website is difficult to crawl. Imagine taking the same road every day to work, but lately, it always has construction on it. Your commute time goes from thirty minutes to one hour due to the mess that the development is causing. If this issue persists for days and weeks, you may decide to change your commute to solve this problem. This muscle memory that you’ve developed is similar to what Google experiences when visiting your site with errors. Remembering a path that causes headaches may sway your decision to revisit it in the future. If you want to learn more about log file analysis, I wrote a summary on what to do. Taking calculated risks within SEO should be part of your daily strategy. Moving target terms to page one on Google will drive additional traffic, leads, and revenue to your business. A complicated risk within SEO is trying to move a term already on page one higher within Google. If you succeed, you will receive more traffic. If you fail, you will potentially lose the traffic you currently recieve. Regardless, you should consider the steps above and apply it to your target keyword theme. 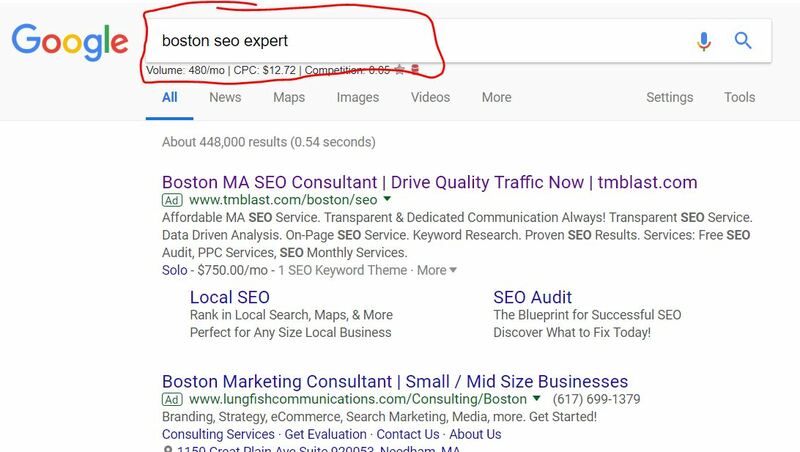 If you would like help with your website, TM Blast is a Boston SEO Company that can drive more quality traffic and leads to your site!